The Long Now Foundation was established in '01996' to develop projects that provide an alternative to today's faster and cheaper mind set and promote slower and better thinking. They hope to creatively foster responsibility in the framework of the next 10,000 years. The name of the organization was coined by one of their founding board members, musician Brian Eno. 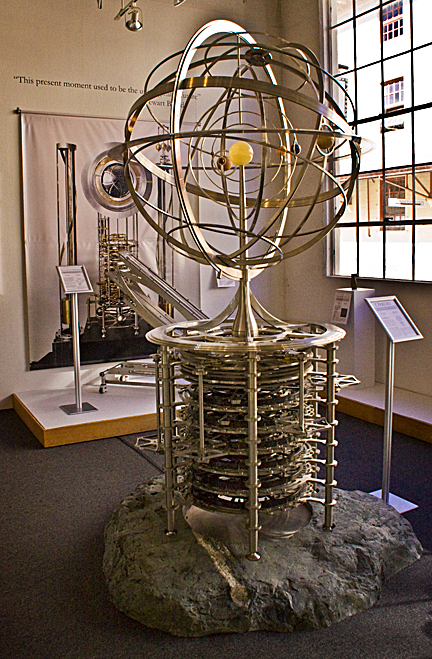 Among their projects is the creation of a 10,000 year all-mechanical clock. The top photo is of the Orrey, a mechanical planetary display for the 10,000 year clock. 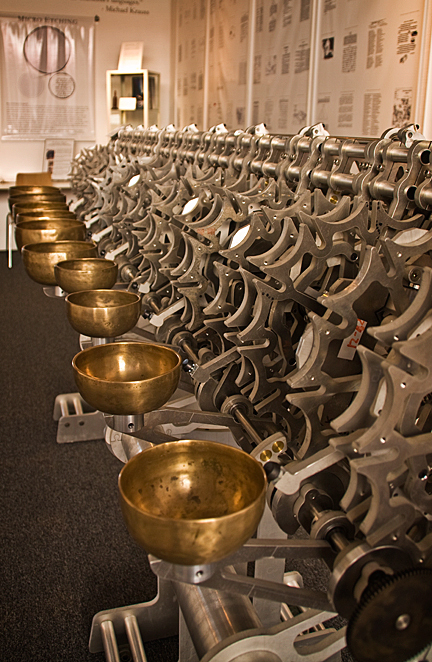 The lower photo is of the Chime Generator which mechanically creates a progressive algorithm that generates a different bell ringing order for each day over the next 10,000 years. Other projects by the Long Now Foundation include the Rosetta Project which is building an archive of all documented human languages. The foundation also offers seminars in long-term thinking by other board members including well-known technologists such as Stewart Brand, Esther Dyson, Mitchell Kapor, and Danny Hillis. The Long Now Foundation projects are available for viewing at Fort Mason and are free to the public.